(Newser) – Two pit bulls turned on their owner in Virginia last week in what the local sheriff has called "an absolutely grisly mauling." Authorities says 22-year-old Bethany Lynn Stephens had been missing for a day when her father found her body in a wooded area where she often walked the dogs, People reports. Goochland County Sheriff James Agnew told reporters that when police arrived they found "various articles of clothing … torn into small pieces" around Stephens' body. She also had defensive wounds on her hands and arms that "would be consistent with being attacked while she was still alive,” Agnew said. 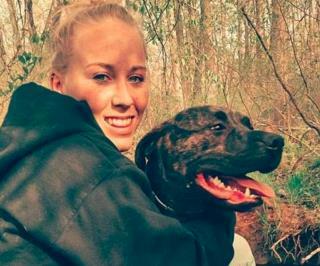 Stephens' father said he found the dogs "guarding" her body when he arrived on the scene. the one eating her ribs was sobbing and crying out "I was a good doggy also!!!!" When are all you pit bull lovers going to finally admit the obvious?